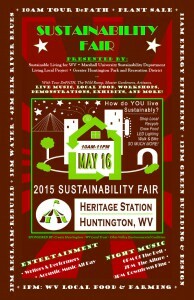 @ Heritage Station, 210 11th St.
A major thunderstorm hit our May 16th Sustainability Fair at around 4:30pm, and forced us to postpone our evening entertainment. In partnership with Greater Huntington Park and Recreation District, we have arranged for a Rain Date on June 27th. This event is free and open to the public.